"Stellar winds are the fast-flowing material—composed of protons, electrons, and metal atoms—ejected from stars," said Pragati Pradhan, a postdoctoral researcher in astronomy and astrophysics at Penn State and the lead author of the paper. "This material enriches the star's surroundings with metals, kinetic energy, and ionizing radiation. It is the source material for star formation. Until the last decade, it was thought that stellar winds were homogenous, but these Chandra data provide direct evidence that stellar winds are populated with dense clumps." The neutron star observed is part of a high-mass X-ray binary system—the compact, incredibly dense neutron star paired with a massive 'normal' supergiant star. 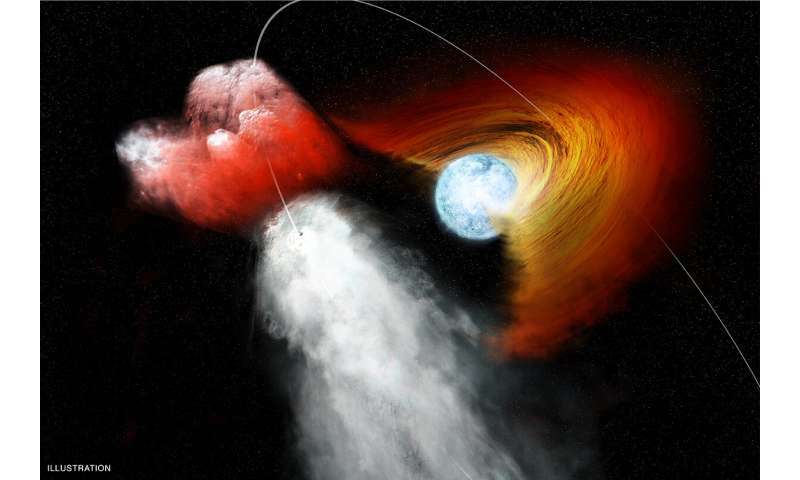 Neutron stars in binary systems produce X-rays when material from the companion star falls toward the neutron star and is accelerated to high velocities. As a result of this acceleration, X-rays are produced that can inturn interact with the materials of the stellar wind to produce secondary X-rays of signature energies at various distances from the neutron star. Neutral—uncharged—iron atoms, for example, produce fluorescence X-rays with energies of 6.4 kilo-electron volts (keV), roughly 3000 times the energy of visible light. Astronomers use spectrometers, like the instrument on Chandra, to capture these X-rays and separate them based on their energy to learn about the compositions of stars. "In this work, we see a dimming of the X-rays from the neutron star and a prominent line from neutral iron in the X-ray spectrum—two signatures supporting the clumpy nature of stellar winds," said Pradhan. "Furthermore, the detection of Compton shoulder has also allowed us to map the environment around this neutron star. We expect to be able to improve our understanding of these phenomenon with the upcoming launch of spacecrafts like Lynx and Athena, which will have improved X-ray spectral resolution." Outflows are ubiquitous in astrophysics. ... what is important for us, there is the picture of the outflows from everywhere and none of inflows into somewhere. That is an obvious asymmetry. Yes, and one central to LaViolette's Continuous Creation model, where the primary source of star-growing material is the central supermassive, (likely gray) core star. Periodic eruptions grow ever stronger as the core star grows naturally from within. Explains a lot of observations. So why is it not even tested by mainstream? Because they are all ever-so-hopeful merger maniacs ! How embarrassing to have promoted fantasy as science for your entire career. Say it ain't so! whereas this most recent news only further supports. Clumpy winds more easily condense into a companion star (or planet), wouldn't you merger maniacs agree? Come on, you can do it! Think logically.